Rett Syndrome (also known as RTT) is a genetic postnatal neurological disorder that affects, almost exclusively, girls. It is not an inherited disorder. It leads to severe impairments affecting every aspect of life, from walking, speaking, and eating, to breathing easily. A hallmark of Rett Syndrome is repetitive hand movements while awake. As with any disorder, assessment of cognitive ability is very complicated, but we know that these children can understand and comprehend far more than they’re able to communicate with us. The evidence is in their attentive eyes, and their ability to express a wide range of emotion. Rett Syndrome is mainly caused by a mutation in the MECP2 gene. To think of it in more understandable terms, picture a book. Now, imagine that some pages are out of order, or even missing, sometimes even up to a full chapter. More than 200 mutations in MECP2 that cause RTT have been found, but there are eight prevalent mutations that identify with most cases of RTT. While it almost always affects girls, there have been cases of boys with Rett Syndrome. 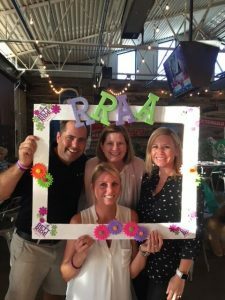 DP Air Corporation has decided to devote their fundraising efforts in 2018 to support research and assistance for Rett Syndrome. It hits very close to home for us, and research can only be funded by private donations. One of our owners has promised to match our fundraising efforts, up to $25,000! 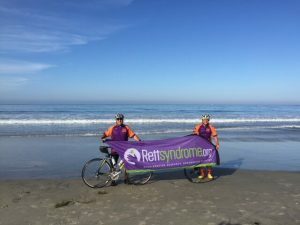 There is a father riding across the country to raise awareness and support for Rett Syndrome, and he made a pit-stop in Tucson, where we had an event for him at a local restaurant! Some of our Corporate staff made the drive down and teamed up with our Tucson branch to welcome him and show support from DP Air Corporation.